Have you ever just stared at your fast food meal and thought, “Wow, this is not at all what I was expecting.” When you go to order fast food, you look at the displays they have outside their store. You gaze back at the large, bold font words entrapping your attention. “Succulent”, “Tender”, “Delicious”, is what they say. To top it all off, the food in the picture’s always look even better than the words can describe. All that anticipation & excitement comes crashing down when the cashier hands you the food, you unwrap it, and you see mushed up pile of bread-meat-bread. How do McDonald’s, Subway, Wendy’s, Taco Bell do this? In the same manner that film companies put their actors & actresses through hours of make up to get them perfect for the screen, these food companies go through extensive preparation for the advertisement of their food. Burgers, tacos, and salads all go through a photo shoot where they are touched up to look like the perfect product. The food itself is prepared at the studio. From there, the food stylists take over. For burgers, they’ll push all the main ingredients to the foreground, making them standout. Cheese & patty are steamed to make them seem more appetizing. Following this, skewers are placed in the burgers to keep everything in an attractive, upright position. Subway sandwiches always look much more bulky in the commercials because the studios will add cardboard or foam in between the layers. Fast food salads will never look like they do in the ads, and have never tasted like an normal salad should. In order to give them that fresh & tasty look, they are sprayed with a bottle of glycerin. Finally, all the food is fixed up with photoshop, to enhance every last detail. Company respond to these claims by saying that the food moves, or that the packaging & backing may cause for the food to be squashed. 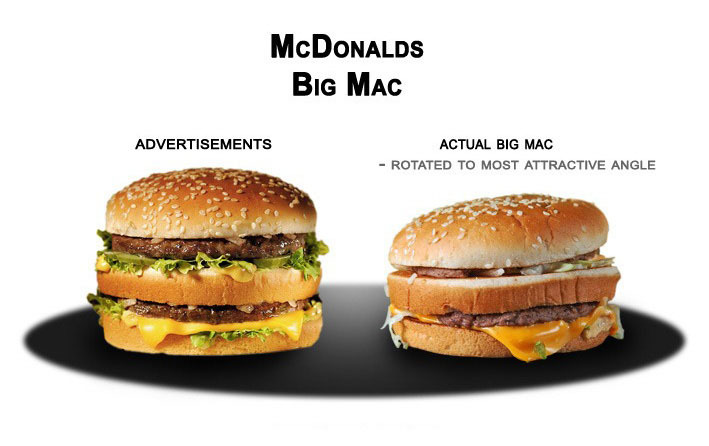 Though the companies are including everything in the burger that they claimed would be there, people still preach false advertising is in play. Technically, these companies are doing nothing legally wrong, and day after day people go back to these fast food restaurants and buy their food. At the end of the day, false advertising can be shouted from the mountain tops, but will it ever effect whether people decide to go out and buy fast food?